A really long time ago I bought this stationery set. I was really intrigued by it when I bought it, and thought I would use it right away. When I brought it home, I had no desire to use it. Probably because it wasn’t 100% ready out of the box; it required some “work” by mixing the ink. I was also intimidated by the quill pen. I have never, and haven’t since, used a quill pen. Fountain pens? Sure! Quill pens are on a whole different level. 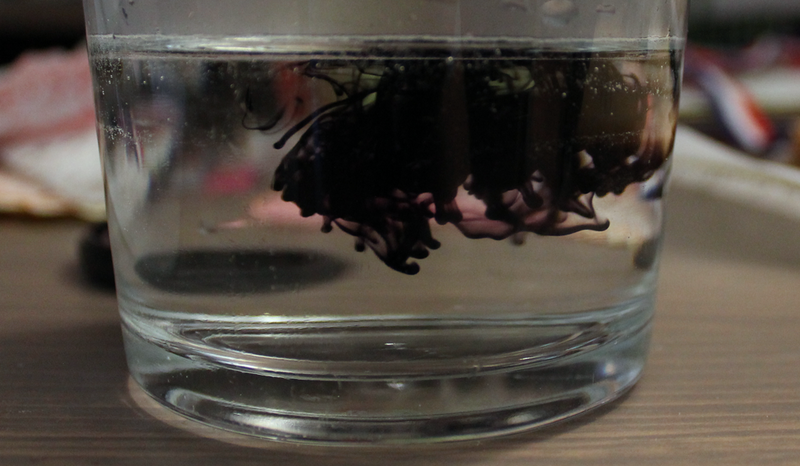 Finally I decided to throw caution to the wind and mixed that ink with some water. Which happened to be my favorite part of this experience. I loved watching the ink! I feel like I used entirely way too much water but, from what I recall, the package called for way too little water. I don’t know anything about mixing ink. 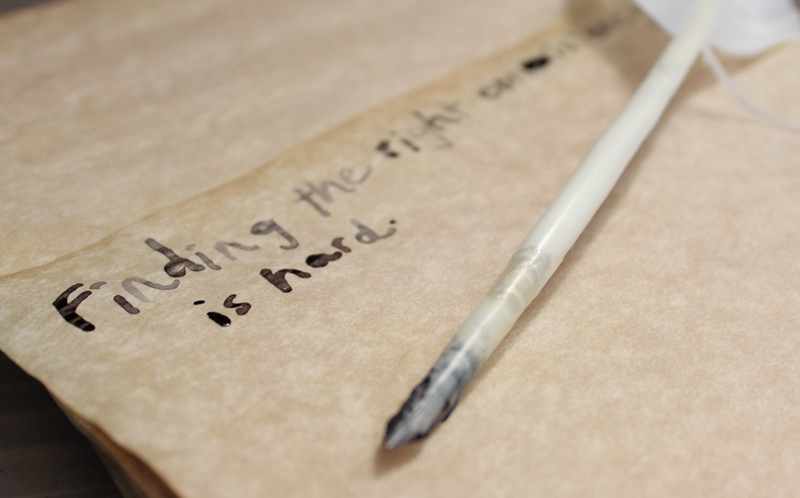 The quill pen itself was a chore to use and the paper was awful to write on. I felt like I had to get more ink after every letter I wrote. When I got too much ink, it would just pile out in a puddle where I was writing. That’s annoying. The only thing I enjoyed about the pen was the broad tip. It made my handwriting look fabulous. I love thick, bold letters. Eventually I got bored and just doodled all over the place. I tried using this blue fountain pen ink I had to see if I could get a better feel for writing with the quill pen but I don’t think it worked. It looked pretty though! 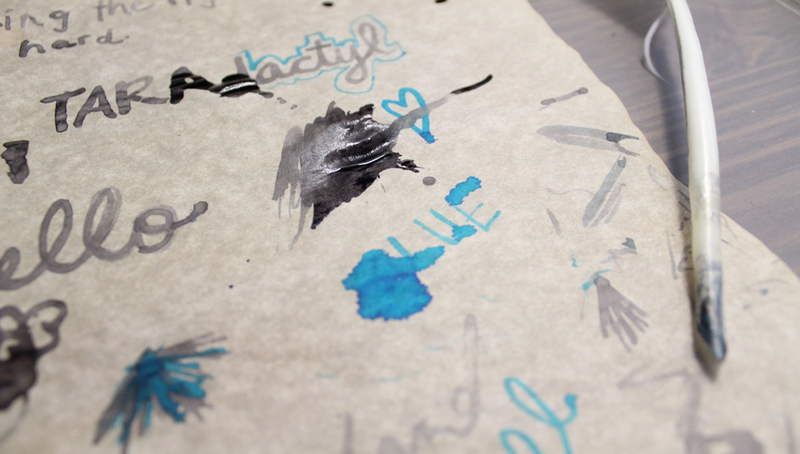 I especially love the way the fountain pen ink seeped into the paper. I thought I would use the remaining paper for writing letters but it was truly the worst paper I have ever used. I tried to write one letter with it and wanted to throw it out the window. Regular pens just did not work on it! It was super scratchy and also had a waxy texture to it. #NEXTLEVELPEN!! so sorry to hear that it didn’t work out – i think the concept is interesting but the mucking about may have been a deterrent for me as well (i do the majority of my writing while in transit on the bus). i wonder if the paper was treated somehow to take that kind of ink better? i love using a metal pen nib with india ink, but do that so rarely now due to the aforementioned issue of convenience. I am all about convenience. I’m also not that into pens or calligraphy so that explains that. I do really love the ink seepage though. Good idea to use it in mail art! i feel ya, sister! convenience and efficiency is everything!